Michael Buckley continues to prove that he is one of the leading restauranteurs in New Hampshire. With Surf, he has done it right again, a seafood restaurant on the harbor in Portsmouth. The hits just keep coming and Surf joins a list of exceptional dining establishments for Buckley including the other Surf Seafood in Nashua, MTS Local also in Nashua and Buckley's (see my review here) in Merrimack. What is impressive is that he has been able to own more than one successful restaurant and is not afraid to make changes or additions that will benefit his customers. We have been to the other Surf in Nashua many years ago and it was a fabulous experience, this was no different. As we walked into the Surf in Portsmouth we were greeted by a smiling hostess who escorted us to a booth on the left hand side. The atmosphere seems to be a perfect fit and design for Portsmouth. There is a surf board, funky hanging colored lights and blue walls all designed to give an ocean effect. They have a few booths on the left side and a large bar in the middle along with many tables out front with a view of the water. There is also a small outside dining area on the water and one on the street. Either way, I recommend that you try to sit at the front closer to the water. Don't think of Surf as a stuffy restaurant, instead it seems to me to be more relaxed, many in shorts or just wearing what feels comfortable, eating, drinking, laughing and having a grand old time. Our waitress stopped by, reviewed the specials and we ordered up some drinks and started to look over the menu. It will be no surprise to anyone that the food is focused on seafood. 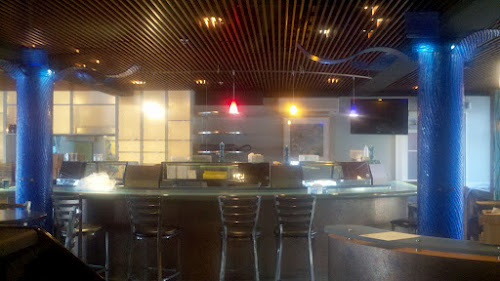 For starters, you will find grilled scallops, crab cakes, clam chowder, a raw bar and salads. We decided on something a little different, The Stickey Rice and Shrimp Rolls and I have to admit, had my doubts on this one as it is served with a peanut sauce that I did not think would be a good combination with seafood. Pleased to report that I was wrong, the sauce worked perfectly with the crunchy outer shell along with the tender inner shrimp and rice. The main courses are divided into Sandwiches and Tacos, World Inspired Seafoods and Specialties and you will find enough variety to make any seafood lover happy. There is Portuguese Seafood Stew, Parmesan Crusted Flounder, Cajun Tilapia and New England Baked Haddock. After much discussion, I decided on the Pan Roasted Atlantic Swordfish and my wife the Baked Lazy Man's Lobster. Both were cooked to perfection, the swordfish served with tomatoes, warm garlic croutons, artichokes, mozzarella and a basil vinaigrette. The latter dish came with a generous portion of lobster along with chive mashed potatoes and asparagus. Our waitress did a great job, no complaints. One thing you will notice about Michael Buckley restaurants is that the staff looks after the details. For example, there is one person whose sole responsibility is to make sure that the water glasses at each table are always full. We went with the chocolate cherry ice cream as our selection for dessert. Normally I don't like chocolate ice cream but this was delicious with a light cherry and chocolate flavor. In the finally analysis, you can't help but like Surf, the atmosphere, food and service combine to make this another home run for Michael Buckley. I strongly recommend that you try Surf in Portsmouth, New Hampshire.